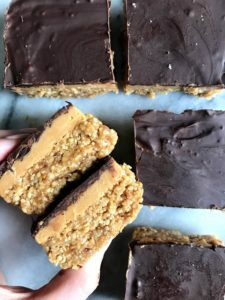 Healthy Peanut Butter Quinoa Crisp Bars that will remind you of rice krispies, but filled with chocolate and peanut butter! I am literally THRILLED to share these with you guys because, truthfully they are one of the best things I have ever made on this blog. Hands down, no questions asked, these grown up rice krispie bars are not to be missed and you should probably do the next best thing and order that bag of puffed quinoa to get you started. Puffed quinoa is something I came across on a few other blogger’s Instagram accounts and I knew I wanted to order it as a fun addition for any potential baked goods. I saw Lindsay, from The Toasted Pinenut, making delicious little peanut butter balls with those crunchy little gems and I knew I needed to get my hands on them. So what is puffed quinoa? It is quinoa that has been puffed, similar to puffed rice cereal, is totally gluten-free, crunchy and a little bit nutty. It can be added into bake + no-bake treats, in trail mix, in cereal, and really anywhere! You can order the puffed quinoa off of Amazon. You can also used puffed rice for this! 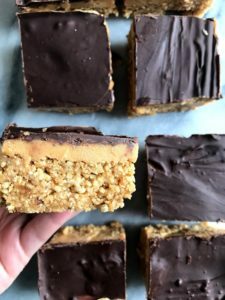 These chocolate peanut butter rice krispie treats reminded me exactly of a rice krispie treat, except chocolate peanut butter and made with all healthy ingredients! I hope you love these as much as I did!! 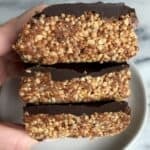 Healthy Chocolate Covered Quinoa Crisp Bars with peanut butter creaminess and made with only a few ingredients! In a food processor, blend rolled oats until very fine, flour consistency. Add in dates, peanut butter, and honey, and process until fully blended. Add in 1-2 Tbsp water as needed to get moving, scraping down sides as needed. Pour into bowl and add in quinoa. Stir till fully combined. Flatten into brownie pan or bread pan depending on desired thickness. Place in freezer for 15 min. In a saucepan, combine peanut butter filling ingredients over low heat. Spread evenly over quinoa base. Freeze for at least 30 min. Cover with melted chocolate and put back in freezer.